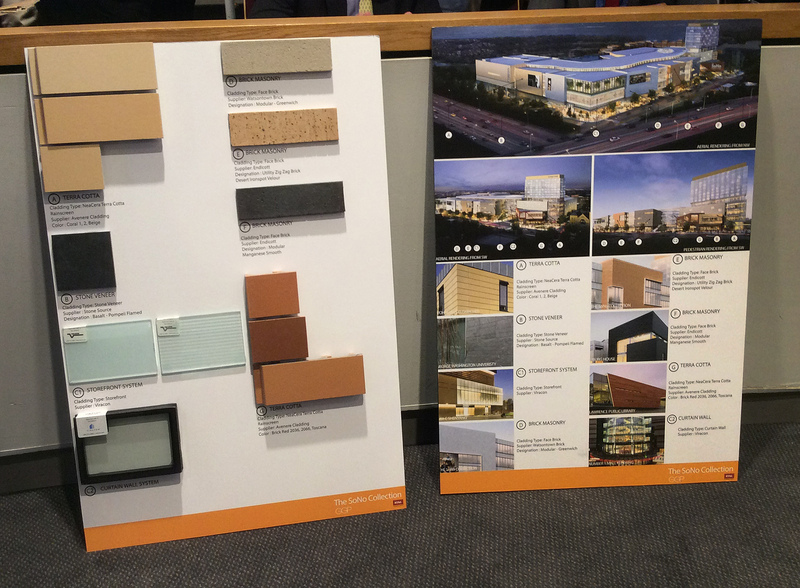 A rendering of The SoNo Collection, as planned by General Growth Partners (GGP). 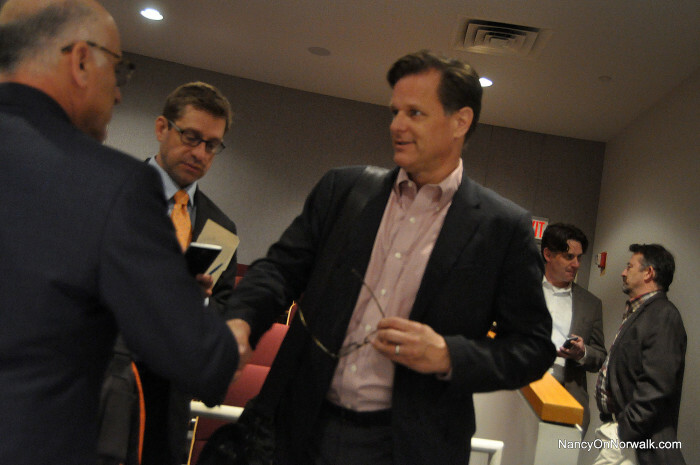 General Growth Properties (GGP) Senior Developer Doug Adams, center, shakes hands with Attorney William Hennessey on Wednesday after the Norwalk Zoning Commission approved GGP’s plan for The SoNo Collection. Updated, 1 a.m., full story; Correction, 12:19 p.m.: The acting Planning & Zoning director is Mike Wrinn. NORWALK, Conn. – The Norwalk Zoning Commission on Wednesday approved General Growth Properties (GGP) application to build a mall on West Avenue, between Interstate 95 and Pine Street. The brief discussion centered on follow-up traffic studies, a sidewalk on Reed Street and legal language that would be a problem in the event of an appeal from the public. The Commission voted unanimously to approve the mall, dubbed The SoNo Collection, with conditions that included pavement markings to guide drivers exiting the parking garage and taking a right on West Avenue. GGP still needs approvals from the Connecticut Department of Transportation (ConnDOT) Office of the State Traffic Administration (OSTA). “This is a big step, the local approvals. We go on to the state for the traffic permits, finish our construction drawings and the permitting, and get in the ground as quickly as possible, later this year,” GGP Senior Developer Doug Adams said. The company is looking for a groundbreaking in late summer or early fall, with construction to begin by the end of the year, he said. An accelerated construction schedule would allow the company to open on schedule in October 2018, he said. Materials planned for The SoNo Collection, as shown to the Redevelopment Agency last week. A Reed Street sidewalk was part of the recommendations made by WSP Parsons Brinkerhoff, the Commission’s traffic consultant for the project. The Commission elected not to go with that recommendation, letting GGP off the hook on the local level. However, OSTA could still require GGP to build the sidewalk, he said. There will be two traffic studies done post-opening, Chairman Adam Blank said during the 17-minute meeting. 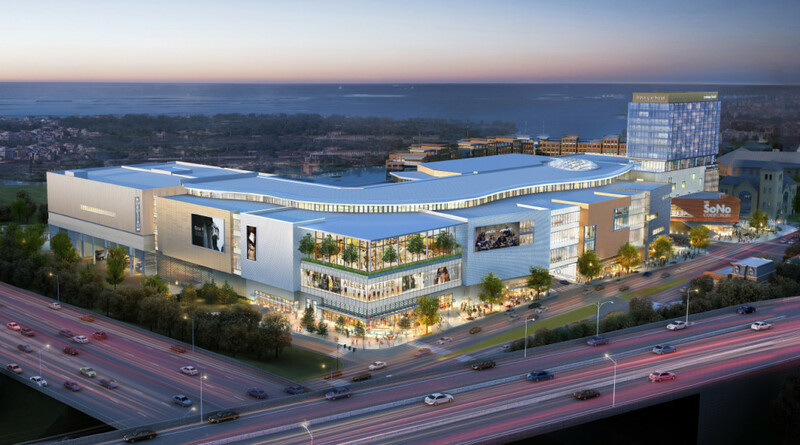 One would be done within six months of the mall attaining 80 percent rental of its retail space, and another within six months of the opening of the hotel for the property. Truck traffic is planned to enter North Water Street and exit along Crescent Street and out Butler Street. GGP is required to implement any OSTA recommendations to address safety concerns for pedestrians walking on West Avenue, under I-95 and across the highway entrance ramps. There was concern that the legal language in the approval not send GGP back to square one in the event of an appeal of the approval by neighbors. Changing a few words satisfied Blank and the Commissioners in that regard. There were almost no comments on the approval. 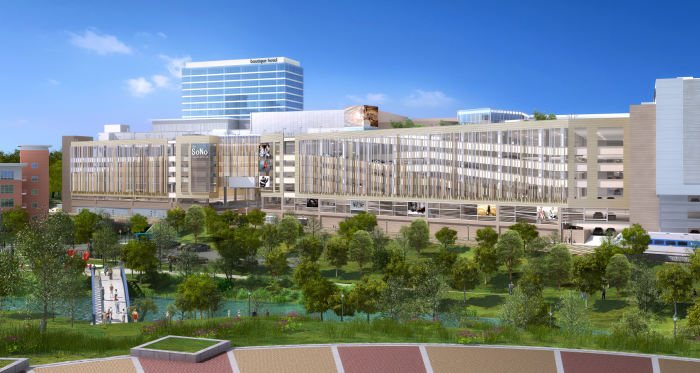 An artist’s conception of General Growth Partners’ proposed parking garage, on the rear of The SoNo Collection. Wrinn thanked the Commission for all it’s hard work. “It’s been pretty difficult,” he said. The Commission’s public hearing on the mall spanned three nights, beginning April 27. “A special thanks to Adam Blank for keeping the whole thing organized and staying focused,” Zoning Commissioner Michael O’Reilly said. GGP later put out a press release touting the approval. The brief discussion centered on follow-up traffic studies, a sidewalk on Reed Street and legal language that would be a problem in the event of an appeal from the public. The Commission voted unanimously to approve the mall with conditions that included pavement markings to guide drivers exiting the parking garage and taking a right on West Avenue. The Commission did not require GGP to build a sidewalk on Reed Street, but the state is still expected to weigh in on traffic requirements. The state might make GGP pay to install the sidewalk, Acting Planning and Zoning Director David Wrinn said. GGP Senior Planner Doug Adams said such a sidewalk would be 1,100 feet long. GGP is not against a sidewalk, but does not feel it should be part of GGP’s project, he said. GGP still needs its state approvals. The company is looking for a groundbreaking in late summer or early fall, with construction to begin by the end of the year, he said. An accelerated construction schedule would allow the company to open on schedule in October 2018, he said. It’s unfortunate that our review and approval agencies did not required GGP to construct to Leeds Gold standards for water conservation, to minimize the impact on our waste water treatment plant. Additionally, Leeds standards would bring Norwalk construction in line with efforts to cope with global warming. Our commissions unfortunately missed the opportunity to require Leeds conformance on the 2800 units recently approved, this was another missed opportunity. First of all, the Director of P&Z is life long Norwalk resident, Mike Wrinn, not the former deputy police chief, Dave Wrinn. Thats pretty sloppy. Second of all, these requirements to comply with some far off standard, Leeds or other, cost real money, and provide virtually nothing in return. Water conservation? Construction to fight global warming? Give me a break. We don’t have water issues here, and the cost of this nonsense would likely stop more development from happening. They approved 2800 units? Now that is another thing…what on earth is the mayor thinking? Is he more concerned with Norwalk, or making more low income housing so that section 8 residents can crowd our schools more? Is Norwalk a sanctuary city now that we need this? @Adolph – It is LEED not leeds.